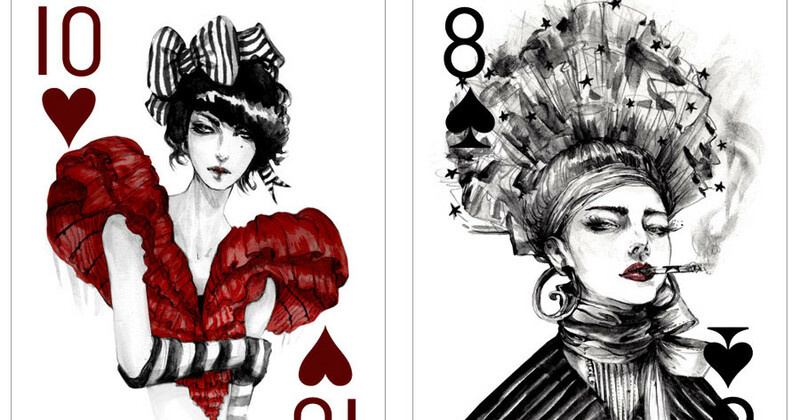 Years ago, fashion illustrator and designer from Los Angeles, Connie Lim started a project about creating hand drawn fashion inspired drawings made into a set of playing cards. Recently, she finally completed the set of cards which is currently crowd-funded through a Kickstarter campaign. Being heavily influenced by fashion, Connie’s drawings perfectly show the fluidity of lines and rich textures applied in beautiful female figures. Using he favorite gouache, micron pens, inks, and watercolors, the meticulous drawings are beauties to behold that reflect different emotions, gestures and stories. The project consists of 54 gorgeous hand-drawn cards that make Connie’s growth as an artist through the years. In working on the series, I found an outlet to both express and evoke emotions through my drawings, which had up to then seemed little more than the sum of individual lines on a page. The impact of that realization meant the project never left the back of my mind, even as my studies and then freelance work took me away from completing what I had started. When successfully funded, the backers of the project in Kickstarter will receive sweet rewards such as signed prints and special surprise drawings from Connie herself. The cards are also available as tote bags and limited edition prints. Scroll down below to see some of our favorites from this beautiful deck. Which among the cards is your most favorite? Tell us via the comments below!